Mirror, mirror, on the wall…it’s hard to tell if you’re the fairest of them all if you can hardly see your reflection! Mirrors, especially bathroom mirrors, seem to magically attract streaks, dust, and splatters, but you can keep the mirrors in your home sparkling clean without using expensive cleaning solutions. 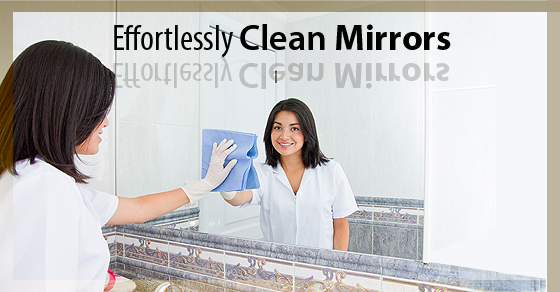 If your mirrors are not very dirty, simply spray on some warm water and rub dry with a microfiber cloth. Rub in circular motions to prevent leaving smears. Use a microfiber cloth, not paper towels. In addition to being wasteful, paper towels can leave residue and streaks behind. If your mirror has a lot of stains, such as toothpaste, hairspray, or makeup, use rubbing alcohol for spot-treatment. Apply the rubbing alcohol to the stains with a cotton pad. Try to work quickly as the alcohol soon dries. Now spray with the vinegar mixture. You could, of course, use store-bought glass cleaner here, but this organic and homemade solution is much cheaper and healthier for the whole family. Now it’s time to wipe! Use the microfiber cloth. Rub in circular motions to avoid smears. If you find any streaks or stains, spray your glass cleaner and wipe it dry. Bathroom mirrors steam up when you shower – just when you need them the most! But here’s a top tip to keep your mirrors shiny at all times: Simply apply shaving foam—note, NOT shaving gel—across the surface of the mirror. Wipe the shaving foam off, and then polish with a microfiber cloth. Vinegar: mix equal parts distilled white vinegar and water. Undiluted vinegar works well on stubborn stains, but will be overpowering if used on an entire surface. Lemon juice: mix 1 tablespoon of lemon juice and 1 quart warm water. Borax: mix 2 tablespoons of borax and 3 cups of water. If you use this cleaning solution, rinse your mirror afterwards with a vinegar and water solution. Cornstarch and vinegar: mix 3 tablespoons of cornstarch, ½ cup of vinegar, and a bucket of water. Some people recommend using newspapers to clean your glass or mirrors. But be aware that modern inks may not leave your mirrors clean! If you want to try the newspaper cleaning method, test a small area before proceeding.